Under Groups Click Create Group and select the type of the group as iOS /Android/Windows Group. From the list of available devices, select the devices you wish to add them to the group and move them to the Added Devices. A new Group will be created for the specific Platform that you have chosen. No Groups can be created with a combination of iOS, Android or Windows devices. A Group can contain different types of devices like smart phone and tablets whereas, every Group should be unique based on the platform.. A device can be a member of more than one Group, and Group can have any number of devices more than one. In case you wish to manage KNOX devices, it is advisable to create a separate KNOX group as it would make the distribution of Apps and application of Profiles easier. Select the Groups tab. This will list the groups that have been created already. Select the specific Group that need to be modified, and click the modify button. Under Available Devices select the specific device that needs to be added and move it to the Added Devices. To delete any device select the specific device that needs to be removed from Added Devices and click on Remove. Click Save Changes to store settings. When a device is removed from the Group, the profiles associated to the devices using Mobile Device Manager Plus will not be removed automatically. Similarly, when a device is added to an existing group, the new device will not receive the existing Profiles automatically. Profile needs to be associated to such devices manually. Click on the List View link for the users/device to be displayed as a list. 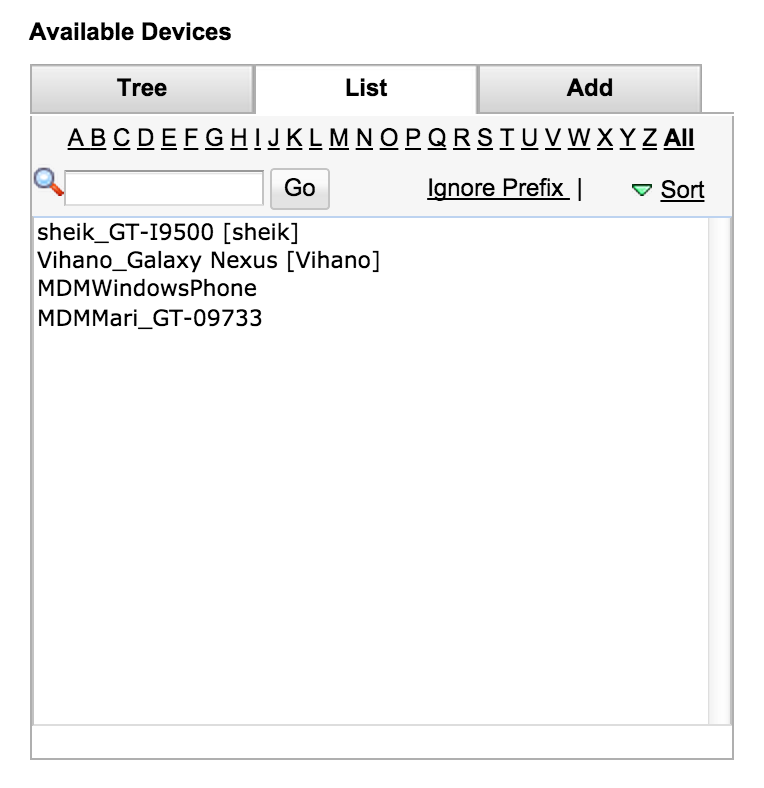 Click on a particular alphabet to view the users/device with names that begin with alphabet specified. Use All link to list all the users/device. Click on the Sort link to sort the listed user/device names. You can use the "Ignore-Prefix" option in combination with your choice of alphabet. This will list all users/computers that have the specified prefix and whose names begin with selected alphabet. For example, the figure below shows a case where MDM is specified in Ignore-Prefix and the alphabet chosen is W. The resultant list therefore shows all the computers who have 'MDM' as their prefix but whose names begin with alphabet 'W'. Click on the Add tab for the users/device to be manually added. Specify a valid User/device in the text field. Click on >> button to add the user/device in the custom group. Incorrect User/device will not be added and the application will throw an error. In that case, specify the correct User/device name and add it again. Click on Create Group button to complete custom group creation.